Kali Puja is one of the most sacred Hindu festivals and dedicated to the Avatar of Goddess Durga in the fearsome form of Maa Kali. The Puja is performed to protect oneself from evil and negative forces which harm our spiritual and mental psyche. It also removes the insecurity haunting the humans. According to legend, Kali Maa manifested from the eyebrow of Goddess Durga. Kali is also popularly known as Kal Bhoi Nashini (the destroyer of evil). Worship of Kali Maa is conducted during Nishitha time (night) on the Amavasya of Kartika month (November-December). Kali Puja is performed with great enthusiasm predominantly in the Eastern region of the country like the state of West Bengal. The celebrations include illuminating homes and temples with earthen lamps, signifying the dispelling of darkness. Kali Matha is one of the most celebrated women goddesses of Hinduism. She always symbolizes victory and even though she is depicted fierce, she is very kind and benevolent. When the fearsome Kali was slaughtering the demons on the battlefield and seemed uncontrollable, Lord Shiva himself appeared before her in the form of an infant. Maa Kali’s maternal instincts instantly came to the fore and she picked the little baby to comfort it. Thus, this form of the Goddess is considered benevolent and kind-hearted where she acts as a protective mother. Kali Puja is celebrated in two ways, Brahmanic and Tantric. Kali Puja celebrations are observed with great fervor and enthusiasm in the Indian sub-continent, especially in the Eastern states. It is celebrated in a big way in Bengal and Assam, akin to the Durga Puja celebrations. The Brahmanic worship of Goddess Kali is observed in the traditional Hindu style of offering oblations to the deity. In this form of worship, Kali Maa is adored as ‘Adya Shakti Kali’. Tantric worship of Kali involves chanting of Tantric Mantras and Stotras, frequently accompanied by animal sacrifice. The offerings to Kali Maa during this style of worship include meat, fish, and head of the goat and red hibiscus flowers. Pandals (temporary structures) are especially erected for this occasion and images of the deity are installed on the altar. Since Kali Puja coincides with the festival of Diwali, fireworks and crackers light up the sky. The cremation grounds in Assam and Bengal also witness Tantric Pujas being performed at midnight on this day. 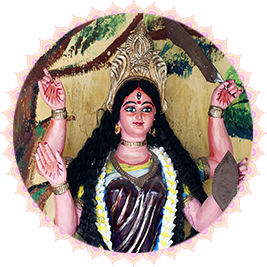 The Kali Puja celebrations coincide with several other popular Hindu festivals, especially Diwali. Both festivals are celebrated for almost the same purpose, i.e. the triumph of good over evil and the dispelling of darkness. Those who pray to Maa Kali with sincerity and deep dedication will surely be blessed with a positive and never-say-die attitude. She dispels fear and negativity, while at the same time ushering in joy and happiness. By performing the Kali Puja, one can get rid of the darkness enveloping us like a shroud and break off the shackles which bind us to despair and hopelessness. Get rid of the darkness enveloping the humans. In this current era, though there is enormous development in science and technology, the problems related to phycology are on the rise. It is very important to curb any sort of negativity in life. Bring joy and happiness in the family. Families split for several reasons. It becomes important to keep the family intact to enhance happiness. Goddess Kali helps her devotees to maintain a good peaceful family life. to the triumph of good over evil and the dispelling of darkness. The darkness inside the humans such as anger, resentment, rage, and ego should be curbed. By praying to Goddess Durga, she will be an amulet and curb all problems in life.